Nothing in Fethering happens unseen. Christmas is approaching in the seaside village of Fethering and Jude is horrified that her neighbour Carole Seddon, retired public servant, has chosen such dull presents for her immediate family. To make matters worse Carole's son Stephen, his wife Gaby and her baby grandaughter Lily will be coming down for Christmas Day. Jude and Carole are a formidable investigative team, and their pursuit of the truth is no longer the casual observation that it was a few books back. They meet often to compare notes and formulate new plans of attack on their suspects. One character, quite a nasty one, has it right: "You are just two nosy old women who have no authority at all", but he underestimates their acumen for sleuthing. I have the same criticism of this novel that I have voiced before about others in the series. In the final chapter Simon Brett launches a few months or more forward, and then tells us how the main characters have fared since the crime was solved. I find it a most peculiar way to round off the novel, rather as if the action of the novel is a slice of pie, and here we have got to the final bit. That probably makes no sense to you at all, but if you do read THE SHOOTING IN THE SHOP think about how you feel about the final chapter. If you remember to, come back and tell me about your reaction. Someone approaches you because they know you read crime fiction. It is a genre they have discovered they like, and they want your suggestions for 3 authors to look for. You may find this difficult to do without being able to quiz them a bit further, but do try. I'm sure you are just bursting with suggestions. Leave a comment if you'd like to tell us what authors you suggested. Mentor a newbie, suggest an author list... at AnswerGarden.ch. In the Answer Garden post I ran this week, an interesting picture is emerging from the titles people have been adding. Then comes Bleed For Me, Dead Point, and Gunshot Road each on 2 - all Australian authors so far. Only two are Scandinavian, only 2 are translated (I think). Leave a comment if you think I am wrong. Note: what is below is only an image! not the actual Answer Garden. It is not too late to enter your own nomination. Do it here. 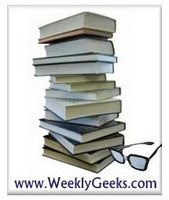 Weekly Geeks 2010-25: Author Picture Quiz - all is revealed! My original post was a response to this week's Weekly Geeks task with some pictures for people to identify..
Smik's Reviews (Latest Additions), they would find some clues. Well done to Margot who got them all correct, and I suspect Dorte did too. THE DIRECTOR, published in 1982, appears in my records for 1984. And there, unfortunately, my information about that particular title ends. I have a vague idea that THE DIRECTOR became the basis of a film. Perhaps someone has this title on their shelves? But I have been able to find out quite a bit about the author: Wikipedia tells me that John Edmund Gardner (November 20, 1926 – August 3, 2007) was an English spy novelist, most notably for the James Bond series. Fantastic Fiction says John Gardner is one of the world's premier thriller writers, and has published more than forty novels, many of which have been bestsellers. 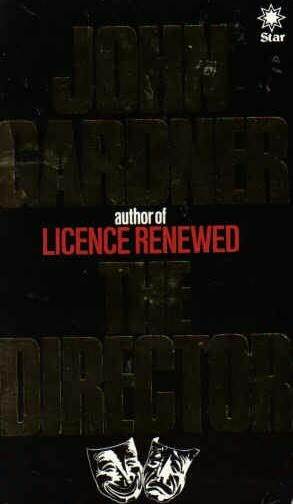 Among Gardner's works are sixteen books in the legendary James Bond series, including Win, Lose, or Die and Never Send Flowers; he has also written six books featuring Big Herbie Kruger, most recently Confessor and Maestro, which was a New York Times Book of the Year. A graduate of Cambridge University who did his postgraduate work at Oxford, he has variously been a stage magician, an officer in the Royal Marines, a theatrical journalist, a lecturer in Shakespearean production and a priest in the Church of England. There's a John Gardner website, mainly celebrating his Moriarty series, although this page is the beginning of a 3 page photo strip of covers of 007 titles he contributed to. It was 1980 when the Board of Directors of Glidrose Publications Ltd. (the copyright holders of the James Bond literary property) decided to bring back 007 to the printed page..... In finding an author to pen the books, apparently Glidrose tossed a few names around and eventually ended up with a list of six possibilities. First on the list was John Gardner. Ironically he actually wrote more 007 books than Ian Fleming. What is the best crime fiction title you've read this year? I'm playing with a cool tool I found at Answer Garden. You have only 20 characters so just the title please. If you submit a title somebody else has used, it will "count" the entries up. What is the best crime fiction title you have read this year?... at AnswerGarden.ch. On the Agatha Christie Blog Carnival we will be taking part in world wide celebrations with a blog carnival tour from 1-30 September. Participants will volunteer for a day in September to host the carnival. Your post of course must be related to an Agatha Christie topic. Indicate your interest in being a stop on the blog tour by leaving a comment on that post or emailing Kerrie. 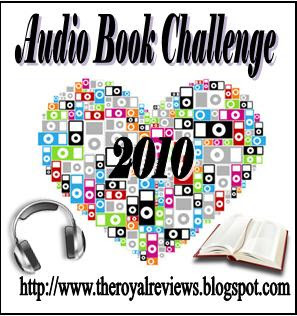 Audio Book Challenge is hosted at Royal Reviews. I listen to books to and from work every day so hopefully this will be relatively easy to achieve. Add to that the fact that I've also realised the usefulness of an audio book on my I-Pod for long flights. I've now made Addicted, so I have set my sights on Obsessed. Isabel Hartman went missing on a hot day in May, nine years ago. She was riding home from school but never got there. We were fifteen. In primary school Sabine Kroese and Isabel had been best friends, but then they had grown apart. Isabel had grown tired of Sabine and she and her friends bullied her, making Sabine's life a misery. Now, nine years on, Sabine is working in an office in a bank in Amsterdam pulling her life together after an absence of nearly a year from work due to a nervous breakdown. Sabine's return to work does not go smoothly. She seems a lot less competent at her job than she used to be, and someone has usurped her role as acknowledged head of the office. Life there is made more bearable by the discovery that Olaf, a friend of her brother's is now working in the IT department. Sabine can remember very little of the day that Isabel went missing, just fragments, but now bits are coming back. The fact that her old school is organising a reunion draws Sabine back to the seaside village where she was born. She has no intention of attending the reunion. Each time returns to the village a little more of her memory comes back. She is convinced that she must have seen who killed Isabel and has been repressing the memory ever since. 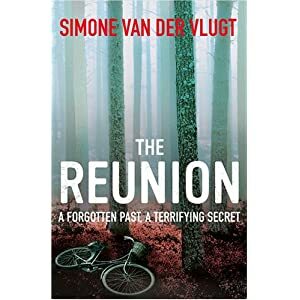 THE REUNION builds rather slowly, but gradually the reader comes to believe too that eventually Sabine will be able to identify the Isabel's killer. THE REUNION is thick with clues if only we could see them, but when you are told things out of context, they have significance only in hindsight. The range of possible explanations narrows down, and simultaneously it feels as if, when Sabine does remember, she will be in great danger. The writing style feels deceptively simple, and I think that comes from the fact that until this point Van Der Vlugt had written only children's books. I particularly like this cover image, and after you've read the book, you'll understand its significance. In the final pages of the book are some notes from the author, giving the reader a little background to the book, and then a set of questions (for discussion groups) about aspects of the story. I'm a little puzzled by the blurb on the back which refers to Simone Van Der Vlugt as "Holland's top selling crime writer." Investigation of her website does not support this claim, although I believe THE REUNION has sold well. Her own site claims she is "one of the Netherlands’ most important authors of historical novels for young readers." According to Fantastic Fiction there will be a second crime fiction novel SHADOW SISTER available in English in December 2010. Insomnia, exhaustion, recurring nightmares. Stephen Sharkey is suffering the after effects of his career as a war reporter, most recently in Afghanistan, where Ben Frobisher, war photographer and friend, has been shot dead on assignment. Hanging up his flak jacket and turning his back on the everyday reality of war, Stephen moves into a quiet and peaceful cottage in the north of England. It seems the perfect environment in which to write his book on the representations of war, one that will be based largely on Ben Frobisher's work. But Stephen's supposed isolation offers no protection from other people's suffering or the shattering effects of human brutality. There were actually two threads in this novel: the Stephen Sharkey one detailed in the blurb, and another story in which Kate Frobisher, sculptor, widow of the dead Ben Frobisher, is central. At the beginning of the story Kate is involved in an accident late at night on an icy road and she is severely injured when her car slams into a tree. Just before passing out she is aware of a man standing next to the car, peering in the driver's window. When she is later rescued by police and ambulance, the "watcher" is never mentioned, but Kate knows he did nothing about rescuing her. Kate has recently been commissioned to create a large bronze statue of Christ for the local church, but she has been severely injured in the accident and has to employ someone to help her make the plaster cast for the sculpture. The local vicar finds someone for her - a man working as a gardener, who has a mysterious background. I'm not sure why I thought this would be crime fiction. 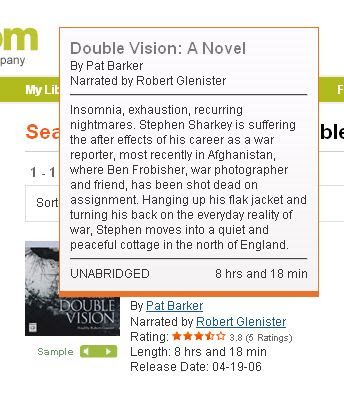 In my defence some of Pat Barker's novels are listed in crime fiction indexes. So I chose this recording on the basis of the author's name, and really should have read the blurb more carefully. The frustrating thing is that a crime is committed, but resolution is not central to the novel. Pat Barker was born in 1943 in Thornaby-On-Tees, Middlesbrough. She studied Economics, Politics and History, going on to teach History at a College. She left this post in 1970, when she found she was pregnant with her first child. Her first novel Union Street was published in 1982. Her second novel Blow Your House Down was published in 1984. To date she has published eleven novels and she has won seven awards for her writing, including the Fawcett Society Book Prize, Guardian Fiction Prize and the Booker Prize for Fiction. I found this image here but did not manage to find the original. It certainly would be striking. 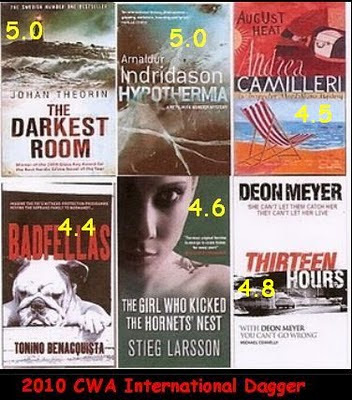 Well, his novel mightn't have won the 2010 CWA International Dagger, but take a look at the large image below! What other novelist has ever done this? Perhaps Agatha Christie would have, if such rating systems had been around in her day. TGWDT has been in Amazon UK's top 100 for just over 2 years, TGWPF for 16 months, and TGWKHN for 9 months! 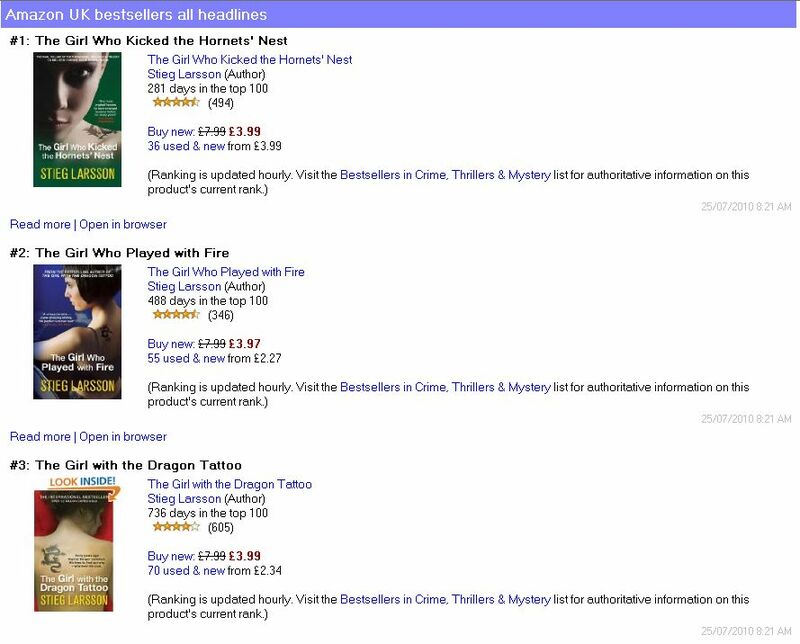 Crime Watch reported yesterday that Larsson has become the second author to top the 1 million ebook mark with "The Girl With the Dragon Tattoo," the first book in the Millennium trilogy, the all-time top seller on the e-book reading device the Kindle. Sunday Salon - today I'm celebrating! #7 in the 2010 Agatha Christie Blog Carnival posted yesterday was huge with 25 items in it. It has been a good reading month: 10 books so far. All reviewed. 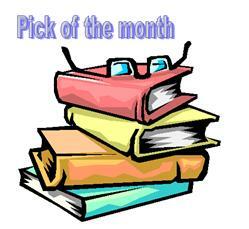 Visit my blog today and look at the Author Picture Quiz. Only 5 pictures of 6 people but I wonder if you know them all? No prizes for guessing correctly, only personal kudos. Have you read them? Leave a comment on the posts about what you thought of them. Otherwise add them to your list of crime fiction to look for. 2010 CWA International Dagger winner is THE DARKEST ROOM. 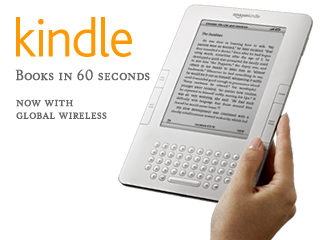 Is 2010 the year of the e-book reader? Here at the Blog Carnival we will be taking part in world wide celebrations with a blog carnival tour from 1-30 September. We have quite a choice in our Weekly Geeks task this week, but it all boils down to giving you some pictures to guess. So here are some pictures. I've numbered them so you can do that with your guesses. If you need help you might like to look at the list on Smik's Reviews (Latest Additions), but I warn you now, they are not all there. All of his working life Reg Wexford has thought he has known of an unconvicted killer. When he was a young police officer, a young woman, Elsie Carroll, was found murdered. Her husband George, who always proclaimed his innocence, was charged with her murder, brought to trial, convicted, and then freed on appeal because of the judge's misdirection of the jury. Wexford's bosses were convinced they had got the right person, but Reg Wexford thought he knew better. He was convinced that a smug little man, Eric Targo, was the real murderer. Reg just didn't know why. When another woman was found murdered, again Reg was convinced Targo had something to do with it, he just couldn't work out the connection. This was the beginning of a strange relationship between Wexford and Targo. Wexford becomes convinced that Targo is stalking him. And then Targo disappears from Reg's life. Now Targo has come back. THE MONSTER IN THE BOX has an interesting structure. Much of it consists of a conversation between Wexford and his deputy Burden, in which Wexford describes all of the times Targo has apppeared his life and why he became convinced that Targo was stalking him. The author uses the novel as a vehicle to reveal to the reader a lot of personal detail from Wexford's life: his early days in the police force, his courtship of his wife Dora. The time frame must go back nearly four decades, and times when Burden has been part of that timeline are pinpointed. As the timeline gets closer to the present, it is clear there will be a more modern incident involving Targo. Wexford is convinced he is a psychopathic killer. I found the time layers of this novel a little confusing. They chose the Olive and Dove, the little room called the snug which over the years they had made almost their own. Of course others used it, as the yellow-stained ceiling and lingering smell of a million cigarettes bore witness. In a few years' time a smoking ban would come in, the walls and ceiling be redecorated, new curtains hung at the clouded wondows and ashtrays banished, but in the late nineties there was no hint of that. Outside the window it was mostly young people who could be seen sitting at the tables under coloured umbrellas on the Olive's veranda, for the evening was as mild as the day had been, while their elders crowded into the saloon bar. All those people or those who succeeded them would ten years in the future be obliged to huddle on that verandah, rain or shine, snow or fog, if they wanted ot smoke. I re-read this passage several times to make sure I had got the time frame correct. I've put the clue I picked up in bold. In fact, Rendell had me reading a few passages in THE MONSTER IN THE BOX several times. That might get the thumbs down from some readers. Ruth Rendell announced last year that THE MONSTER IN THE BOX is her last Wexford novel. If it is, then I am disappointed, because even though it does survey all of Reg's life, it doesn't feel to me he has gone out on the high that I wanted. You might like to check this post: Forgotten book: FROM DOON WITH DEATH. "the strength of this author’s writing is such that it does not matter if some elements of the novel are a bit predictable, because it is so full of rich (but lightly presented) detail, with so many very astute observations about the changes in society over the past 50 years during which this series has been written, that one is simply held to the pages, until the last one is turned." "this book ... has an elegiac quality to it"
Want the full list of Ruth Rendell novels? : check Fantastic Fiction. Don't forget she writes as Barbara Vine too. The winner of this year's CWA International Dagger is Johann Theorin's THE DARKEST ROOM, translated by Marlaine Delargy. I reviewed it in February, giving it my highest rating, 5.0. 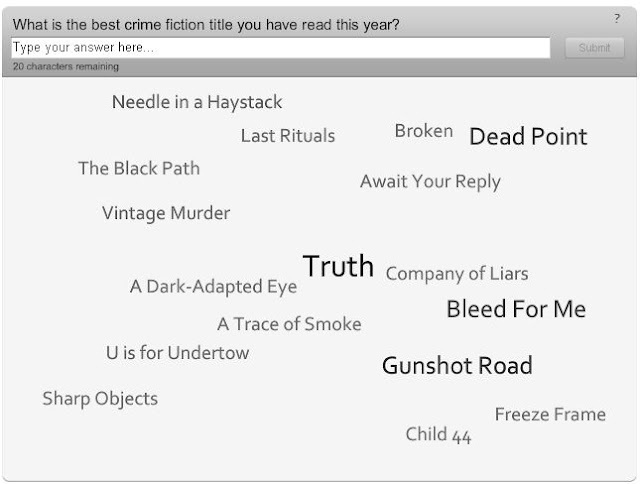 When I asked people to tell me the best crime fiction titles they had read so far this year, 15 people responded, and 6 (40%) included THE DARKEST ROOM on their list. But I must admit I thought HYPOTHERMIA might just win. Would Agatha Christie really have been interested? I have a Google Alert out for references in blog posts and other online places to Agatha Christie. I've been thinking for some time about the way people casually refer to her in passing, and wonder whether they are attributing false characteristics to her, or whether it is an example of some sort of literary snobbery - you know, they sound better, carry more authority, because they "know about" Agatha Christie. The old lady’s butler became suspicious of Woerth, and secretly taped the fellow’s conversations with his employer. (Agatha Christie, where are you?) The two talked about money, cash, secret Swiss accounts, a yacht, oh, and the Jews. From a blog post titled Sarkozy: Banning Burqas and Collecting Envelopes? in the National Review where David Pryce-Jones talks about people who have designs on the money of Madame Liliane Bettencourt, aged 87. She’s inherited L’Oréal cosmetics, and a fortune of about sixteen billion euros makes her one of the richest women in Europe. Agatha Christie would be proud of the plot line unfurled ahead of tonight's Tri-Nations return match between the All Blacks and South Africa. From a report titled Springboks: Men of Mystery all about their current rugby tour of New Zealand. It all boils down to an admission that the New Zealand side has very little idea of what to expect in the coming match. From an article in the online Bloomberg Business Week, Beware Greedy Relatives If You Hope to See 2011 by Kevin Hassett about the fact that in the US estate tax this year is 0%. In a plot twist worthy of Agatha Christie investigators said Rosenberg made the recording knowing that two days later, on May 10, assassins he had hired would ambush him near his home. He was shot three times in the head, once in the neck and once in the back. He apparently hoped the video would render him a martyr. Possibly the most unusual mystery ever written. A murder is committed, behind closed doors, in bizarre circumstances. Three amateur detectives take the case: Lord Simon Plimsoll, Monsieur Amer Picon, and Monsignor Smith (in whom discerning readers will note likeness to some familiar literary figures). Each arrives at his own brilliant solution, startling in its originality, ironclad in its logic. Meanwhile Sergeant Beef sits contemptuously in the background. "But," says Sergeant Beef, "I know who done it!" I must have enjoyed CASE FOR THREE DETECTIVES, #1 in the Sergeant Beef series, because right under that entry in my records for 1988 appears the second in the series. CASE WITHOUT A CORPSE (1937). Leo Bruce was a pseudonym for Rupert Croft-Cooke (1903-1979). In the latter name he published a formidable array of books from 1933 to 1978. He also wrote a number of non-fiction titles. 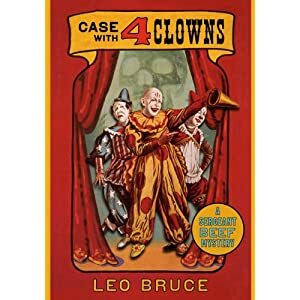 Interestingly the third title in this list CASE WITH FOUR CLOWNS is being re-published in the US in September this year. See Amazon. 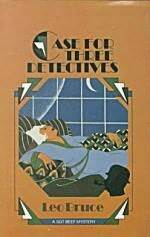 Beginning in 1955 Bruce wrote another detective series: Carolus Deene, senior history master at the Queen's School, Newminster, who acts as an amateur sleuth.This series had 23 titles in it, the last one being published in 1974, so he published more than one a year. Over the same period he published 40 novels as Rupert Croft-Cooke, so in some years he published at least 3 books a year. I have not got around to reading my scheduled Agatha Christie novel this month - I should have read the ABC MURDERS! I have read 18 novels out of an estimated 87, although I keep seeing different numbers. The other day I saw 103 as the total number of novels - I hope not. I have also read 95 short stories coming from 8 collections. I'm not sure just how many short stories there are to hunt down. Perhaps someone has seen a number somewhere? What is fascinating me is just how prolific a writer Agatha Christie was. She must have been writing constantly, many short stories every year, as well as a novel every year. 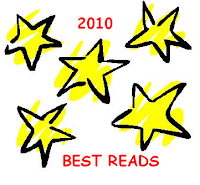 In some years 2, even 3 novels, were published and that is a fabulous output. The short stories were usually published one at a time, in a popular magazine, and then compiled later for publication as a collection. 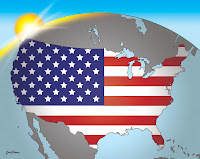 The fact that many of the novels and even the short story collections were published in the US and the UK under different titles causes some confusion. I've written before about detectives whom I enjoy renewing acquaintance with - Reg Wexford, Guido Brunetti, Precious Ramotswe, and just recently I added Bennie Griessel and Kubu Bengu to that list - well, Armand Gamache is one of those. I also enjoyed the opportunity to learn more about his personal life, and to strike up a better acquaintance with his wife, Reine-Marie. One of the things that I like about Armand is his strength of character. There's a touch of humour in A RULE AGAINST MURDER when some of the Finney family write him off as a shopkeeper, well below their social status. Most of them are very surprised to find out his true identity. He reminds me a lot of Maigret, and I'm not sure whether that is not his "Frenchness" coming out. 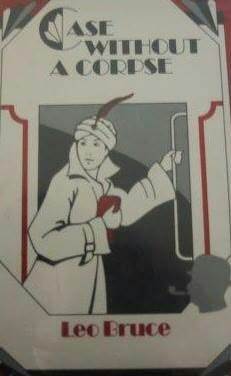 The plot of A RULE AGAINST MURDER is beautifully constructed, and apart from Gamache himself there are some very interesting characters such as the chef Veronique, the child Bean, and the owner of Manoir Bellechasse, Madame Dubois. 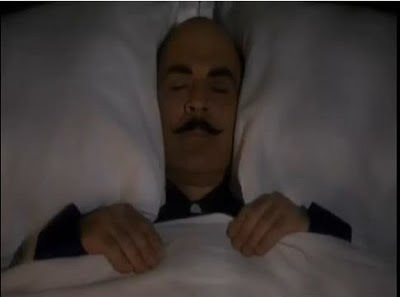 There's something a little cozy about the construction, something Poirot-ish about Gamache too. In many senses it is a locked room mystery - someone in the house party must have committed the murder. The other aspect of the book that struck me is how it builds on our knowledge of the characters from the village of Three Pines whom we may have met in earlier books. Even if you haven't read any of the earlier books, do get this one. At the moment Amazon is selling the hardback at an amazing $US3.78! Louise Penny's first novel was runner up in the Crime Writers' Association's Debut Dagger Award in 2004, in manuscript form. In the early morning of Thanksgiving Sunday, 76 year old Jane Neal is found dead in the woods of the small Canadian village of Three Pines. She has been shot through the heart by a hunter's arrow - was it an accident or is it murder? There are many secrets in this village and this case gets a distinguished detective from Surete du Quebec, Chief Inspector Armand Gamache. Jane had recently entered a revealing village 'portrait' into the village art competition. Her great friend Timmer Hadley had also recently died. Were the events connected? Most enjoyable, but not for the impatient, one-more-title-to-add-to my-list, reader. Be prepared to spend some time sifting the clues. #2 in the Armand Gamache series. In the little Canadian village of Three Pines another death has occurred. A female spectator, the hated CC de Poitiers, has been electrocuted while out on the ice watching the annual Boxing Day curling match. This has to be murder but no-one saw anything. Coincidentally the victim has been living in the house that was the centre of the last murder in Three Pines, Gamache's case a year ago, the focus of Penny's debut novel STILL LIFE. Gamache renews old acquaintances in the village and we learn more about him. Do read these books in order if you can. I was so taken with an image of Hercule Poirot trying to blot out the sound of people arguing in the next room, that I went searching for the video on YouTube. Just in case you didn't know, although I have pointed it out before, you can often get tasters of the Agatha Christie TV films on YouTube. This was no exception. If the embedding does notwork for you above, then here is the link. If you choose to watch it on YouTube itself then you will also find more labelled Appointment with Death Part 2, Part 3.. and so on up to Part 9. If you have an iPad, then search for Appointment with Death in the YouTube App. I have discovered so many of the movies based on Agatha Christie novels are available in the same way. For example there are 896 entries on YouTube for Miss Marple. Perhaps if you need some encouragement to read British crime fiction, this challenge hosted at Book Chick City, will be the challenge for you. I've excluded my Agatha Christie reading from the list below:, but as you can see, I've already completed the challenge. To qualify, the titles I chose had to be written by British writers, set in Britain, crime fiction, and read this year. I'm sure I'll read more during the remainder of the year. I've really shamelessly borrowed the title of this blog post from one I found recently, on a site called Baby Name Wizard. Fictional characters are the best-named group on the planet. Their secret, of course, is that they're not named at birth. Their creators have the luxury of knowing who they become before choosing custom-tailored names. She goes on to talk about how in recent films characters are re-named, or given extra bits to their name. That got me thinking about when writers name their characters. I remember reading one book where the character's name changed mid-book. I was reading an ARC and the author had changed his mind about what the character's name would be. So writers, when do you name your characters? Have you ever changed your mind? How difficult is it to write a story or a novel if you don't know what the character is to be called? Readers - what are the most peculiar names you've ever seen? Have you ever come across your own name? I know also of a practice where a writer has held a competition, or even raised money for charity, to decide on a character's name. I remember at least one book where the character is not named at all (Bill Pronzini's Nameless Detective series) - perhaps you can list more? So that raises another issue doesn't it - how uncomfortable does not knowing who the protagonist is make you feel? For those on the other side of the ditch, closer to Christchurch, NZ, I hope you have the Christchurch Writers' Festival, or more precisely Friday 10 September in your calendar. On that night the inaugural Ngaio Marsh Award for Best Crime Novel will be presented. In a recent post, Peter Rozovsky from Detectives Beyond Borders has revealed not only that he is a judge, but that a short list for the award has been decided. Peter also revealed that the award is the "brainchild of the enterprising Craig Sisterson of the Crime Watch blog,"
So if you are looking for some New Zealand crime fiction to read, these are obviously starters for your list. I have only read one of them, so I have a way to go to catch up. I can get Burial and Access Road from my library. A bevy of Kiwi writers, poets and performers including Dave Dobbyn, Roger Hall, Rachael King, Chris Laidlaw and Helen Lowe. This week's Weekly Geeks task asks us to think about the books we have sitting on our shelves, and don't get around to reading. Instead of reading one of those we choose the latest, newest book we've bought. Sound familiar? What makes me do that? Is there a cure? This week's Weekly Geek host, Tara, makes a lot of sensible suggestions about coping with the problem, but I'm afraid none of them really helps me. 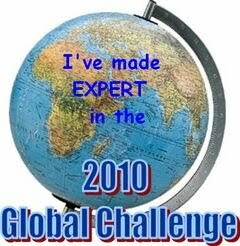 I can't choose yet another challenge: it is challenges that are partly responsible for the problem. Over on Reactions to Reading, Bernadette blames some of the problem on "such worthy activities as the Global Reading Challenge and the CWA International Dagger Award Shortlist", and I think she's hit the nail on the head! One of things that I have found is that the longer a book languishes on my shelves, the less attractive it seems to become. I was really pleased a week or two ago when I realised that both the books suggested for discussion for my next f2f (face 2 face) book group meeting were already on my shelves. I arrange books on shelves in the order in which I should read them - that doesn't stop the hand from picking the wrong one. I make lists - even visible ones like the Currently Reading block in the side bar of this blog - or sometimes just private ones, on the shelf. For some of the challenges I have joined I have considered the books on the shelves very carefully to see if any there fit what I need. I used to be able to take some of the books away with me when I have travelled - I've been known to pack 7 or 8 books for a week away from home - but that one doesn't work now when I have my Kindle which is an attractive weight saver. I've been borrowing fewer library books so I have more time to focus on the books I already have. I rarely visit a book store, but then when I do, it is like being at a luscious buffet, and my resistance is low! So perhaps you have a solution? Suggest away! A good week for me is when I get a lot of reading done. Earlier this week I did a bit of travelling, flights that took 2-3 hours, and so I got quite a bit of reading done, and some reviews written. 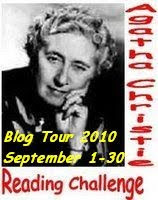 The ACRC Blog Carnival will be taking part in world wide celebrations of Agatha Christie's 120th birthday with a blog carnival tour from 1-30 September 2010. Participants will volunteer for a day in September to host the carnival. Your post of course must be related to an Agatha Christie topic. Indicate your interest in being a stop on the blog tour by leaving a comment on the blog post, together with a suggested date. Please include the title/location of your blog. ABC Radio National - E-books:The future of publishing? 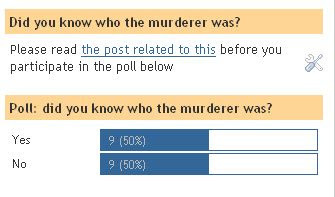 Last week's poll asked "In the most recent murder mystery you read, did you know who the murderer was?" I had thought that whydunnits were becoming more prevalent, but among this blog's readers, the balance is even. Those who left comments however described books which synched with my own recent experience of knowing right from the start who committed the crime, and then being a spectator as the investigators came to the same understanding. I came across this short story in an unexpected place: Alfred Hitchcock's Mystery Magazine for September 2010, which I have recently subscribed to on my Kindle. Michael Nethercott introduces the story in a section in the magazine called MYSTERY CLASSIC. Among other things he pays tribute to Agatha Christie as his inspiration and muse: solid, tweedy, very British, and cresting eighty by the time he first read her. The story was included in AHMM because this year marks the 120th anniversary of Agatha Christie's birth. If you know a bit about Christie’s life there are some obvious conclusions to be drawn from this story. It was written in 1926 and first published in 1927 in Pearson’s Magazine. Published in While the Light Lasts and Other Stories and also in The Harlequin Tea Set and Other Stories in the US. A friend decided to buy some books online, and received the following email, which brought a smile to my face. And then the email goes on to detail where the books are being sent, how long they will be in transit etc. I notice you have quite a comprehensive and well catalogued Mystery Books & Thrillers section too. Read on my Kindle, with a complimentary copy from the author. After working with him on a previous contract Sedona O'Hala should know better than to accept a dinner engagement with Steve Huntington. Especially when he wants her to leave her current managerial job at Strandfrost to take up another undercover one at Acetel services. There are rumours rampant about mismanagement at Acetel and Steve needs Sedona to become one of the employees and find out what is really going on. Their dinner where he is to tell her all turns into a disaster when two goons turn up looking for Steve and he makes a quick exit leaving Sedona to pay the bill. Just as Maria's first Sedona O'Hala book EXECUTIVE LUNCH struck a chord with me, so did EXECUTIVE RETENTION. Someone appears to be reducing the company's profitability, and not even retrenchments are restoring it. I am very well aware of the pre-occupation with the balance sheet. I thoroughly enjoyed the plot of this latest offering. Maria held a poll to make the final choice for the cover of EXECUTIVE RETENTION. See the alternative covers here. An excerpt is online here. I am restricting my participation in the 2010 Global Reading Challenge to crime fiction titles, but participants can use books of any genre of their choosing. + a ´wildcard´ novel (a novel from a place or period that is NEW to you). And if you are really an extreme reader, you will do your best to read novels from 21 different countries or states. Just recently I saw a comment on a blog that Amazon were rolling out upgrades to their current registered Kindles. When they did it before (the first time I think) I received notification, had to connect my Kindle to my PC, and go to a link in an email which then took care of the upgrade. However the last couple of upgrades have happened without notification and when I have connected to Whispernet, and I have accidentally discovered they have been done. I am a bit alarmed that these are things “done to me” in the name of progress, and that I don’t actually get notification from Amazon. It isn’t as if they don’t have my email address. - I can now create collections and add books to those collections. - However if you show by collection, you get a different number, so I am not sure what is happening there. Archive is not treated as a collection. I've managed to put some titles into Archive but at the moment can't work out how I did that or whether that functionality has disappeared. - in Archived Items there is a heading Add Other Device Collections - it requires you to connect to wireless and then I think it will show collections on any other device registered to your account. Might be handy for libraries. - Play MP3 - listen to music or podcasts while you read. The MP3 files have to be copied from your computer into the "music" folder on your Kindle. This will be battery hungry I think. - Depending on what has been provided by the publisher, you may be able to get cover, table of contents, beginning, or a location. - Book Description: requires wireless connection: useful if you are reading a free sample and want to buy the book. BTW I think that if you don’t have wireless turned on, and don’t use the audio, then the battery life is about 30 hours. Battery improvement was one of the earlier upgrades. RED APRIL covers the period Thursday March 9 - Wednesday May 3, 2000. It is set in Ayucucha, Peru. On Wednesday, the eighth day of March, 2000, as he passed through the area surrounding his domicile in the locality of Quinua, Justino Maya Catazo (31) discovered a body. This opening sentence is the "hook" that gets the reader into RED APRIL. It is also the beginning of a report by Associate District Prosecutor Felix Chacaltana Saldivar into the discovery, by Justino Maya, of a charred body lying next to him in a hay loft. Maya has been celebrating Carnival for 3 days with dancing and drinking and barely remembers passing out in the hay loft. The body is found to be missing an arm. There's a cross on its forehead and it is Ash Wednesday. Chacaltana's formal report is a remarkably convoluted document, following all the prescribed procedures, words chosen with precision. It requires police corroboration and signature which he finds extraordinarily to obtain. It is the eve of the national elections and the beginning of Lent. Chacaltana is originally from Ayacucho, but has lived in Lima since he was a boy. He has returned after an absence of twenty years to be with his mother. The terrorism that has marked the past in Ayacucho has gone. But Chacaltana begins to wonder if in fact terrorism is dead, or is the local brand, the Senerista, the Sendero Luminosa, still very much alive, and responsible for this murder? Sunday March 12 2000 is the official start of Lent, with the parade in Ayacucho, established by decree in 1994 at the request of the archbishop. As the community moves through religious observances and public events towards the resurrection of Christ, Chacaltana increasingly comes to believe he is seeing the resurgence of terrorism. His role changes from prosecutor to investigator, and his relationship with the local police and military changes. There's so much I haven't told you about this novel but I recommend you make this journey of discovery for yourself. I found the first quarter of the book quite difficult to read, and then it seemed as if the author grew into his task. But by then I had worked out whose the "voices" were, and how the book was structured. You need to remind yourself too that the reader is being given a window into Peruvian culture, fascinating stories to absorb, an underlying critique of a political system where the president is re-elected even when the vote goes against him. There is more than one murder, and when Prosecutor Chacaltano deduces the pattern, I found myself predicting what the next would be like, and who it would be. I didn't expect the ending. Santiago Roncagliolo was born in Lima, Peru, in 1975. RED APRIL will be published in eleven languages and marks his debut in English. 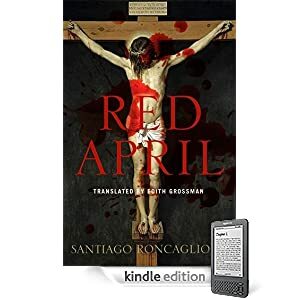 The book is based on factual events of Holy week 2000, but all the characters and most of the situations and places are fictitious, and factual details have been manipulated. Santiago Roncagliolo is the youngest ever winner of Spain's Alfaguara Prize, awarded to him in 2006 for this book. He currently lives in Barcelona. Did you know who the murderer was? 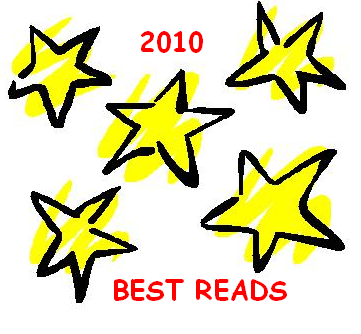 Best Crime Fiction so far 2010 - what's yours?